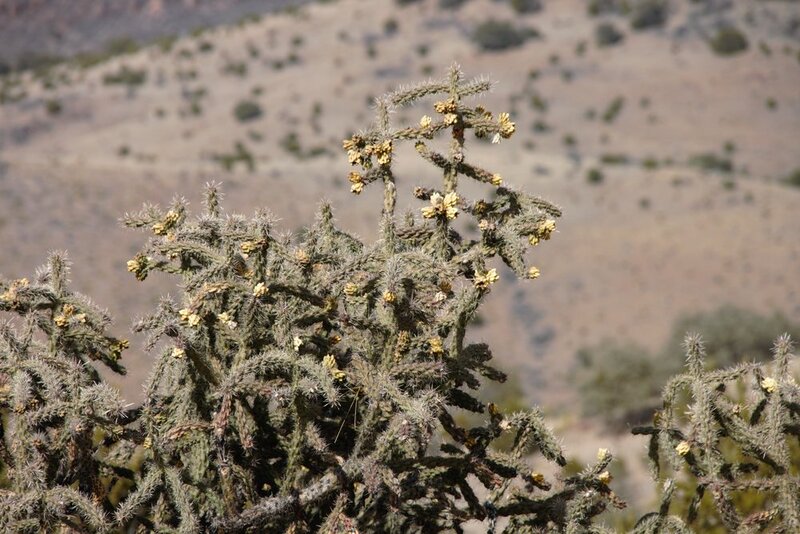 To survive in a desert, plants must eek out an existence in specific microclimates that provide conditions that are only slightly better than the surrounding landscape. Such is the case for the Rose of Jericho (Anastatica hierochuntica). This tenacious little mustard is found throughout arid regions of the Middle East and the Saharan Desert and it has been made famous the world over for its "resurrection" abilities. It is also the subject of much speculation so today we are going to separate fact from fiction and reveal what years of research has taught about this desert survivor. Natural selection has shaped this species into an organism fully ready to take advantage of those fleeting moments when favorable growing conditions present themselves. A. hierochuntica makes its living in dry channels called runnels or wadis, which concentrate water during periods of rain. It is a desert annual meaning the growth period of any individual is relatively short. Once all the water in the sandy soil has evaporated, this plant shrivels up and dies. This is not the end of its story though. With a little luck, the plants were pollinated and multiple spoon-shaped fruits have formed on its stems. 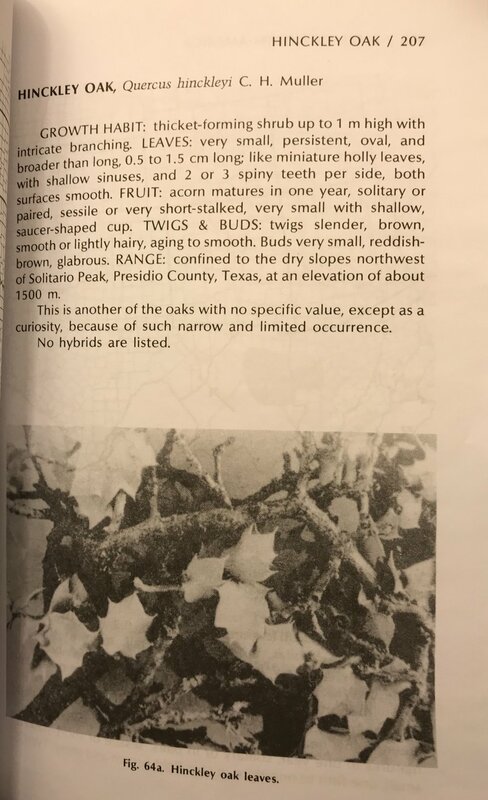 As the dead husk of the plant starts to dry out, its branches curl up into a ball-like mass with most of the fruits tucked away in the interior. There the plant will sit, often for many years, until rain returns. When rain does finally arrive, things happen fast. After all, who knows how long it will be before it rains again. Thanks to a quirk of physiology, the dried tissues of A. hierochuntica are extremely elastic and can return to their normal shape and position once hydrated. As the soil soaks up water, the dried up stems and roots just under the surface also begin taking up water and the stems unfurl. To call this resurrection is being a bit too generous. The plant is not returning to life. Instead, its dead tissues simply expand as they imbibe liquid. Water usually does not come to the desert without rain and rain is exactly what A. hierochuntica needs to complete its life cycle. Unfurling of its stems exposes its spoon-shaped fruits to the elements. Their convex shape is actually an adaptation for seed dispersal by rain, a mechanism termed ombrohydrochory. When a raindrop hits the fruit, it catapults the seed outward from the dead parent. If rains are light, seeds do not get very far. They tend to cluster around the immediate area of their parent. If rains are heavy, however, seeds can travel quite a distance. This is why one will only ever find this species growing in channels. During the rare occasions when those channels fill with water, seeds quickly float away on the current. In fact, experts believe that the buoyancy of A. hierochuntica seed is an adaptation that evolved in response to flooding events. It is quite ironic that water dispersal is such an important factor for a plant growing in some of the driest habitats on Earth. To aid in germination, the seeds themselves are coated in a material that becomes mucilaginous upon wetting. When the seeds eventually come into contact with the soil, the mucilage sticks to the ground and causes the seeds to adhere to the surface upon drying. This way, they are able to effectively germinate instead of blowing around in the wind. Again, things happen fast for A. hierochuntica. Most of its seeds will germinate within 12 hours of rainfall. Though they are relatively drought tolerant, the resulting seedlings nonetheless cannot survive without water. As such, their quick germination allows them to make the most out of fleeting wet conditions. Occasionally, the balled up husks of these plants will become dislodged from the sand and begin to blow around the landscape like little tumbleweeds. This has led some to suggest that A. hierochuntica utilizes this as a form a seed dispersal, scattering seeds about the landscape as it bounces around in the wind. Though this seems like an appealing hypothesis, experts believe that this is not the best means of disseminating propagules. Seeds dispersed in this way are much less likely to end up in favorable spots for germination. Though it certainly occurs, it is likely that this is just something that happens from time to time rather than something the plant has evolved to do. In total, the Rose of Jericho is one tough cookie. Thanks to quick germination and growth, it is able to take advantage of those rare times when its desert environment become hospitable. I love the ocotillo (Fouquieria splendens) for many reasons. It is an impossible plant to miss with its spindly, spine-covered stems. 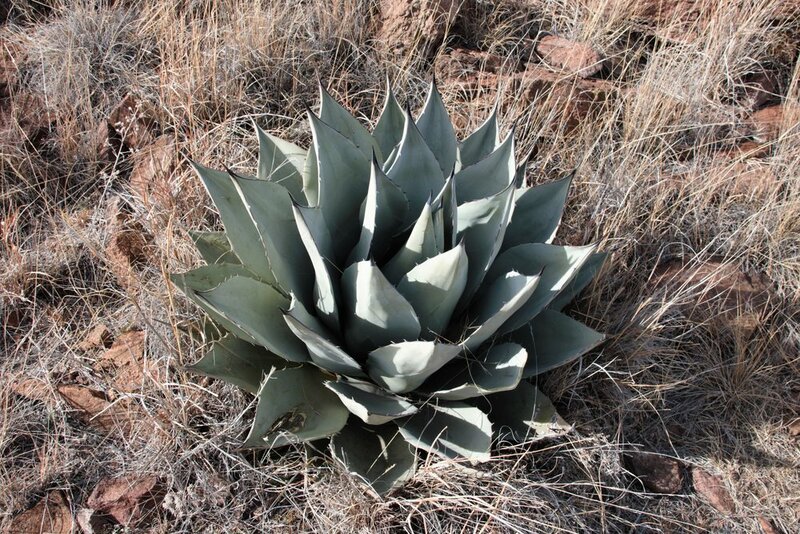 It is a lovely plant that is right at home in the arid parts of southwestern North America. Beyond its unique appearance, the ocotillo is a fascinating and important component of the ecology of this region. My first impression of ocotillo was interesting. I could not figure out where this plant belonged on the tree of life. As a temperate northeasterner, one can forgive my taxonomic ignorance of this group. The family from which it hails, Fouquieriaceae, is restricted to southwestern North America. It contains one genus (Fouquieria) and about 11 species, all of which are rather spiky in appearance. Of course, those spines serve as protection. 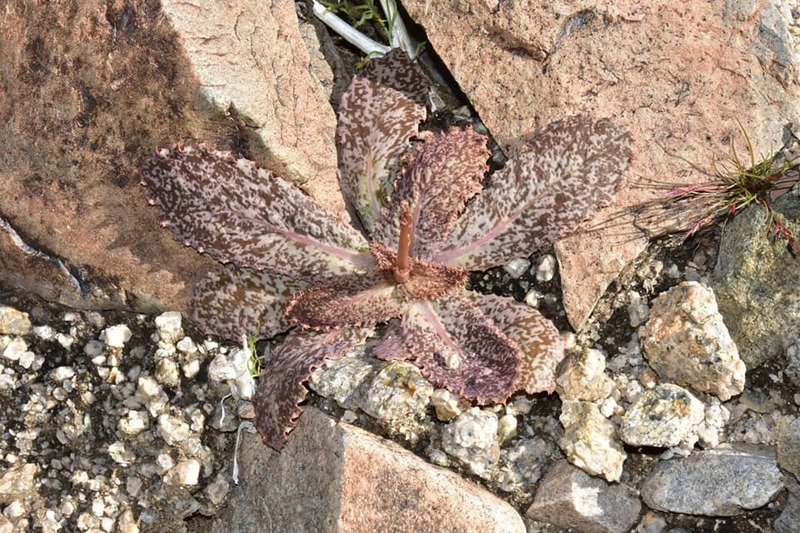 Resources like water are in short supply in desert ecosystems so these plants ensure that it is a real struggle for any animal looking to take a bite. Those spines are tough as well. One manged to pierce the underside of my boot during a hike and I was lucky that it just barely grazed the underside of my foot. Needless to say, the ocotillo is a plant worthy of attention and respect. One of the most striking aspects of ocotillo life is how quickly these plants respond to water. As spring brings rain to this region of North America, ocotillo respond with wonderful sprays of bright red flowers situated atop their spindly stems. These blooms are usually timed so as to take advantage of migrating hummingbirds and emerging bees. The collective display of a landscape full of blooming ocotillo is jaw-droppingly gorgeous and a sight one soon doesn't forget. It is as if the whole landscape has suddenly caught on fire. Indeed, the word "ocotillo" is Spanish for "little torch." Flowering isn't the only way this species responds to the sudden availability of water. A soaking rain will also bring about an eruption of leaves, turning its barren, white stems bright green. The leaves themselves are small and rather fragile. They do not have the tough, succulent texture of what one would expect out of a desert specialist. That is because they don't have to ride out the hard times. Instead, ocotillo are what we call a drought deciduous species, producing leaves when times are good and water is in high supply, and dropping them as soon as the soil dries out. This cycle of growing and dropping leaves can and does happen multiple times per year. It is not uncommon to see ocotillo leaf out up to 4 or 5 times between spring and fall. During the rest of the year, ocotillo relies on chlorophyll in its stems for its photosynthetic needs. Interestingly enough, this poses a bit of a challenge when it comes to getting enough CO2. 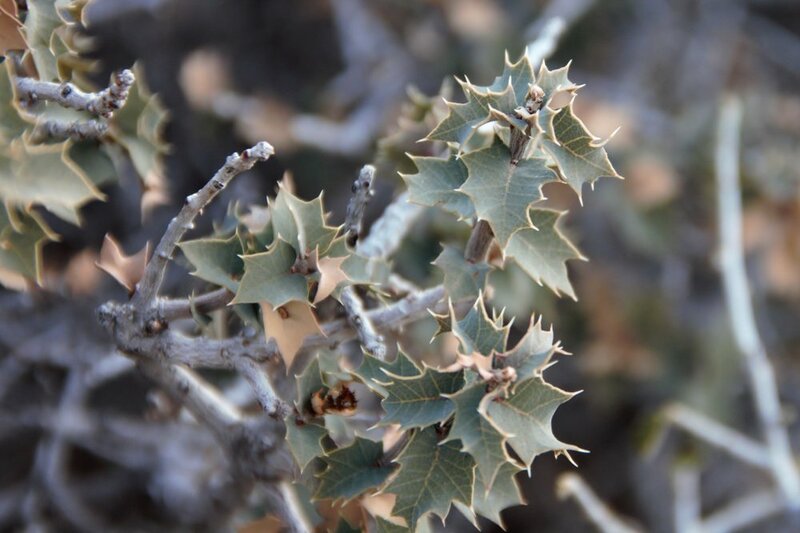 Whereas leaves are covered in tiny pours called stomata which help to regulate gas exchange, the stems of an ocotillo are a lot less porous, making it a challenge to get gases in and out. This is where the efficient metabolism of this plant comes in handy. All plants undergo respiration like you and me. The carbohydrates made during photosynthesis are broken down to fuel the plant and in doing so, CO2 is produced. Amazingly, the ocotillo (as well as many other plants that undergo stem photosynthesis) are able to recycle the CO2 generated by cellular respiration back into photosynthesis within the stem. In this way, the ocotillo is fully capable of photosynthesis even without leaves. Through the good times and the bad, the ocotillo and its relatives are important components of desert ecology. They are as hardy as they are beautiful and getting to see them in person has been a remarkable experience. They ad a flare of surreality to the landscape that must be seen in person to believe. The Pima pineapple cactus (Coryphantha robustispina) is a federally endangered cactus native to the Sonoran Desert. It is a relatively small cactus by most standards, a fact that can make it hard to find even with a trained eye. Sadly, the plight of this cactus is shared by myriad other plant species of this arid region. Urbanization, fire, grazing, and illegal collection are an ever present threat thanks to our insatiable need to gobble up habitat we should never have occupied in the first place. Deserts are lands of extremes and the Pima pineapple cactus seems ready for whatever its habitat can throw its way (naturally). Plants are usually found growing individually but older specimens can take on a clustered clonal habit. During the winter months, the Pima pineapple cactus shrivels up and waits until warmth returns. Come spring, the Pima pineapple cactus begins anew. On mature specimens, flower buds begin to develop once the plant senses an increase in daylight. The flower buds continue to develop well into summer but seem to stop after a certain point. Then, with the onset of the summer monsoons, flower buds quickly mature and open all at once. It is thought that this evolved as a means of synchronizing reproductive events among widely spaced populations. You see, seed set in this species is best achieved via cross pollination. With such low numbers and a lot of empty space in between, these cacti must maximize the chances of cross pollination. If they were to flower asynchronously, the chances of an insect finding its way to two different individuals is low. By flowering together in unison, the chances of cross pollination are greatly increased. No one is quite sure exactly how these cacti manage to coordinate these mass flowering events but one line of reasoning suggests that the onset of the monsoon has something to do with it. It is possible that as plants start to take up much needed water, this triggers the dormant flower buds to kick into high gear and finish their development. More work is needed to say for sure. Seed dispersal for this species comes in the form of a species of hare called the antelope jackrabbit. Jackrabbits consume Pima fruits and disperse them across the landscape as they hop around. However, seed dispersal is just one part of the reproductive process. In order to germinate and survive, Pima pineapple cacti seeds need to end up in the right kind of habitat. Research has shown that the highest germination and survival rates occur only when there is enough water around to fuel those early months of growth. As such, years of drought can mean years of no reproduction for the Pima. Taken together, it is no wonder then why the Pima pineapple cactus is in such bad shape. Populations can take years to recover if they even manage to at all. Sadly, humans have altered their habitat to such a degree that serious action will be needed to bring this species back from the brink of extinction. Aside from the usual suspects like habitat fragmentation and destruction, invasive species are playing a considerable role in the loss of Pima populations. Lehmann lovegrass (Eragrostis lehmanniana) was introduced to Arizona in the 1930's and it has since spread to cover huge swaths of land. What is most troubling about this grass is that it has significantly altered the fire regime of these desert ecosystems. Whereas there was once very little fuel for fires to burn through, dense stands of Lehmann lovegrass now offer plenty of stuff to burn. Huge, destructive fires can spread across the landscape and the native desert vegetation simply cannot handle the heat. Countless plants are killed by these burns. Sometimes, if they are lucky, large cacti can resprout following a severe burn, however, all too often they do not. Entire populations can be killed by a single fire. What few plants remain are frequent targets of poaching. Cacti are quite a hit in the plant trade and sadly people will pay big money for rare specimens. The endangered status of the Pima pineapple cactus makes it a prized target for greedy collectors. The future of the Pima pineapple cactus is decidedly uncertain. Thankfully its placement on the endangered species list has afforded it a bit more attention from a conservation standpoint. Still, we know very little about this plant and more data are going to be needed if we are to develop sound conservation measures. This, my friends, is why land conservation is so important. Plants like the Pima pineapple cactus need places to grow. If we do not work harder on setting aside wild spaces, we will lose so much more than this species. What could be a more iconic symbol of the American West than the tumbleweed? From an early age we are indoctrinated with rustic images of tumbleweeds blowing across the high desert. But, did you know that there is very little about this iconic plant that could be considered American? That's right, our most common species of tumbleweed, Salsola tragus, is actually from Russia. Salsola tragus, also known as Russian thistle, was accidentally introduced to South Dakota in the 1800's in a shipment of flaxseed. It is not actually a thistle at all but rather a member of the family Chenopodiaceae. Since then it has managed to spread throughout most of North America. In arid regions it has become quite a pest. The tumbling aspect of its ecology has to do with seed dispersal. When the seeds mature, the plant dries up and breaks at the base. As the wind proceeds to blow the tumbleweed around it sprays seeds in every direction. 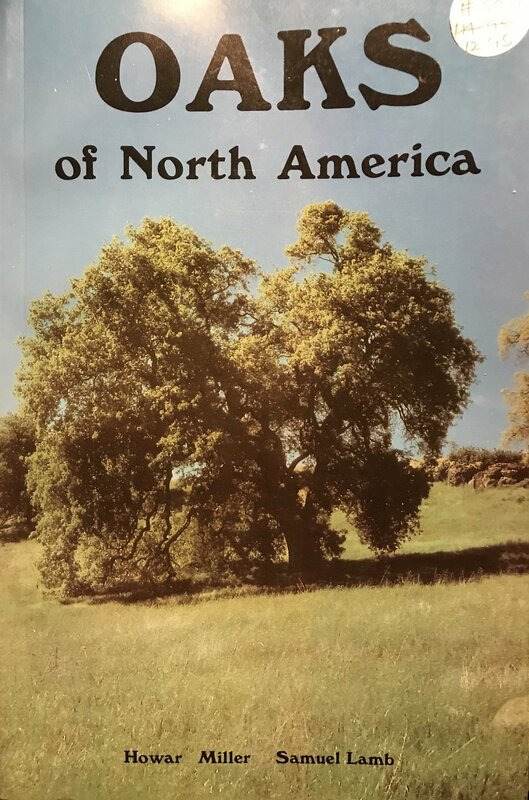 Thanks to this novel method of seed dispersal it is easy to see how this plant is so common as to literally become synonymous with the American West.